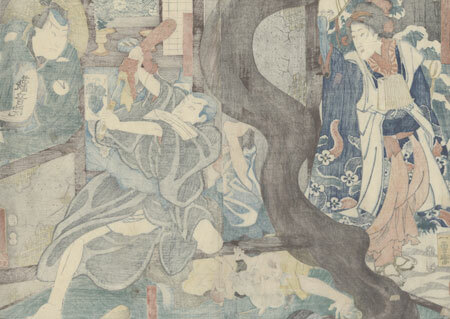 Comments - Intriguing scene from the kabuki play "Azuma Kudari Gojusan Tsugi." In the center, a wooden beam crushes a gray-haired woman, who grimaces and flails her legs and arm, knocking over a kettle on the floor brazier in a cloud of smoke. 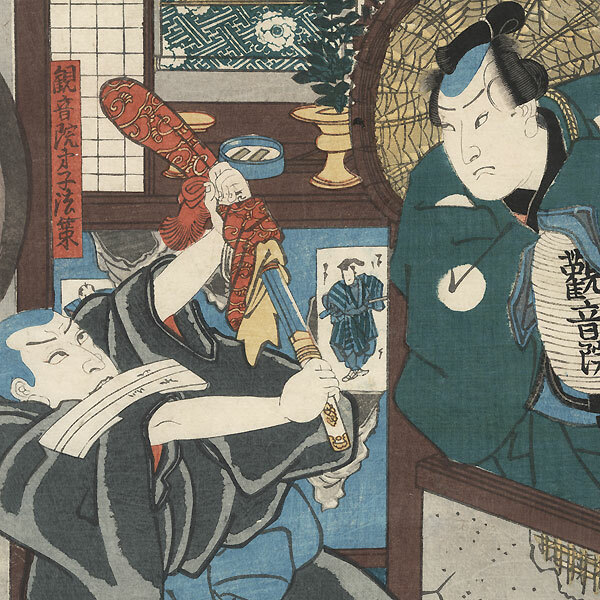 The monk leans on the beam with one knee as grips a sword with one hand, removing the cloth cover with his other hand, a letter or poem slip caught between his teeth. At right, a man watches with a frown, sheltering the light from a lantern beneath his kimono sleeve. At left, the pilgrim Osen, who is actually the bandit Hitomaru Oroku looks on with a sly smile as she lifts her hat. The house is rundown with cracked and missing plaster, and snow covers the foliage and ground outside. The actors include Bando Shuka I as Osen (Hitomaru Oroku), Arashi Rikan III as Kannon-in Genan Kyusuke, and Ichikawa Kodanji IV as Kannon-in Deshi Husaku. A fascinating image with a wonderfully detailed setting. Image Size - 14 3/8" x 19 1/2"
Condition - This print with excellent detail as shown. Two separate panels. Vertical fold at edge of each panel. A few wormholes, repaired. Slight toning and soiling, a few creases. Please see photos for details. Good overall.